When I saw Elder Scrolls Online a few months ago, it was revealed that the player will be sent on a central quest in the vein of those presented by the franchise's single player offerings. In ESO's case, it will revolve around the daedric prince Molag Bal, who takes the liberty of stealing your soul very shortly after character creation. This new trailer details the premise briefly, and shows off some in-game footage of Molag Bal's plane of Oblivion, Coldharbour. In keeping with Coldharbour's nautical park theme, the realm itself is trying to quite literally drop anchor and merge with Tamriel. Dark Anchors will serve as part of the game's dynamic content, spawning enemies similar to the Oblivion gates we learned to love and hate in Elder Scrolls IV. Along with the tie-in to the main quest, we've also been told these will hook up with the Fighters' and Mages' Guild progressions. 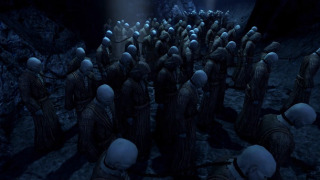 The purpose of Coldharbour is, purportedly, to store the mortal souls Molag Bal has enslaved. By the looks of it, he just likes chaining them together and having them sway in mute misery. I guess it adds to the ambience, but I feel like he could be doing more with so many captive, androgynous, bald figures in drab robes. You know, get some frozen lemonade stands going. Those anchors are going to be bringing in a lot of foot traffic, after all. If you haven't already, you can sign up for the ESO beta on the official site .